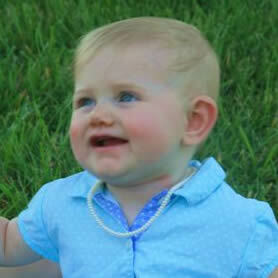 We are going green here with this beautiful freshwater rice pearl necklace in a triple strand design. 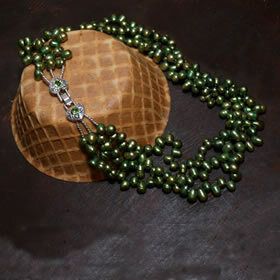 The color of these pearls are a forest green which looks fabulous on all skin tones. 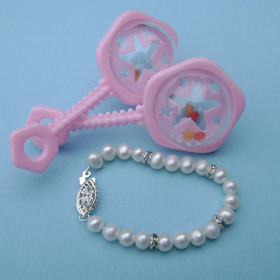 The size of the pearls are 5mm and when twisted gives a really stunning look. The clasp is a heart shape three strand pewter clasp and the peridot crystal in the middle is also heart shaped. Truly an eye catching piece that can be worn all year round. 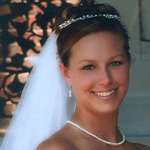 This necklace can be custom designed in the length of your choice. Please call for pricing. You will make a statement when you wear this triple strand necklace designed with 6mm white rice freshwater pearls and 7mm turquoise glass teardrop beads.The combination of these two colors together is breathtaking. The silver tone hook and eye clasp makes it easy to wear. The necklace is hand designed with silk thread and is hand knotted for extra security. This necklace can be custom designed to any length you desire. This very unique triple strand freshwater pearl necklace is designed with 3 colors of Keshi pearls.The size of the pearls range from 4mm to 13mm and each pearl has its own unique shape and a wonderful luster. The pastel colors are green, pink and light blue. The clasp is a silver plated hook and eye clasp and the necklace is hand knotted on the finest silk thread. This is a one of a kind necklace which certainly makes a statement. This piece can be custom designed in your special size. 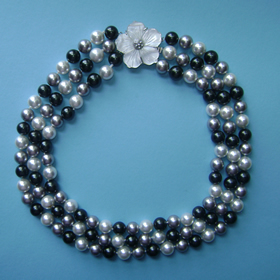 Beautiful 10mm shell pearl triple strand necklace. 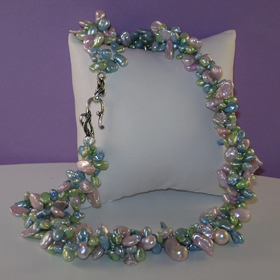 The three colors in this necklace are White, Tahitian, and Silver. This necklace is individually hand knotted on silk thread. The three strand silver tone white mother of pearl clasp is done in a 5 petal flower design and has clear crystals in the center. The clasp has a bold look and measures 21x16mm - 36x30mm. This necklace should be worn with the clasp on the side for a more dramatic look. Simply stunning! The top strand is 16" in length. This necklace can be designed in your preferred length. 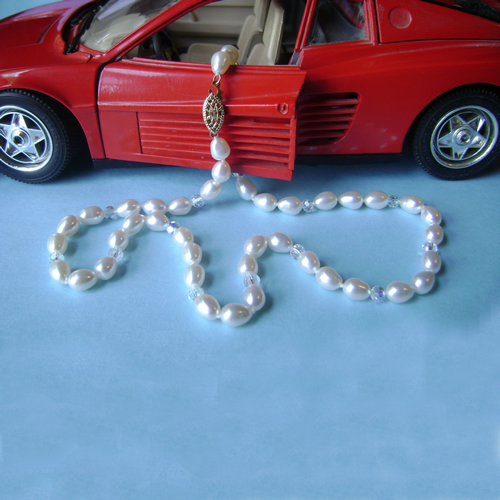 See our Necklace Length Guide for help selecting the perfect size for your pearl necklace.